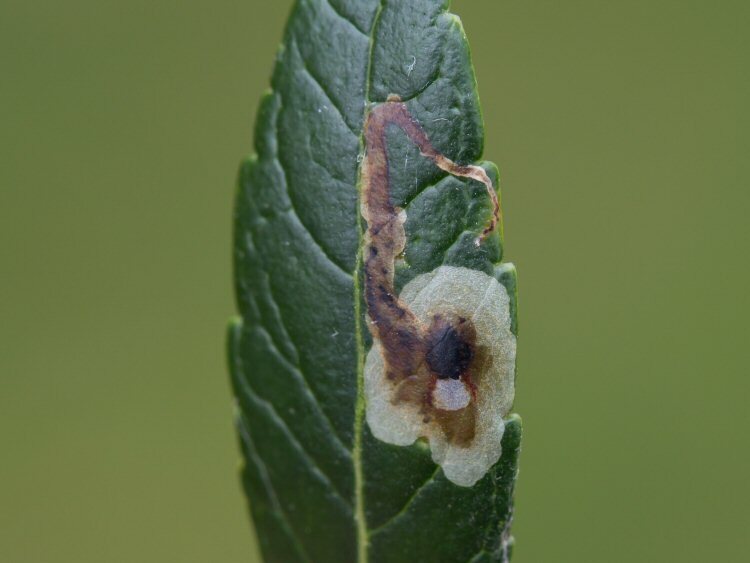 Notes: An upper surface mine which initially is a brown corridor with pale edges, opening into a large blotch, which is blister like (as shown). The blotch may cover the initial gallery. The mines may be positioned centrally on the leaf or may occur at the tip. There is usually one mine per leaf but two or three mines are not uncommon. Frass is variable being in strips or large grains along the edge of the corridor. Frass accumulates in the centre of the blotch and is seen as a black spot there (as shown). Pupariation is within the mine and the puparia are a pale colour. They may appear darker as they adhere to the black frass when forming puparia.This is the first record of this species in the UK (and possibly Northern Europe) and was discovered in Bedfordshire in 2018.